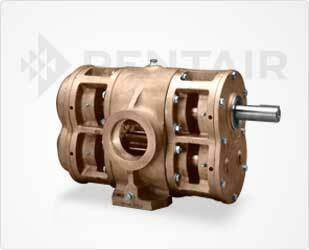 A rotary gear pump is “a positive displacement pump which uses a rotor and idler gear assembly to generate its flow”. Simply put, a rotary gear pump uses the friction and motion of the gear teeth meshing to create a smooth flow of whatever fluid you are trying to pump. The powerful mechanism is ideal for handling viscous fluids, but it is also an optimal choice for more sensitive fluids as well. The resulting flow from the pump is a smooth, non-pulsating flow that is perfect for any fluid used to extinguish a fire. How Does the Model 300 Rotary Gear Pump Affect My System? If a Model 300 rotary gear pump is right for your fire pump system, you will enjoy the ultimate peace of mind that your system will always operate smoothly in any scenario. The non-pulsating flow of up to 300 PSI offers a smooth, strong stream of foam concentrate or water to the emergency site. A smooth flow is imperative to quick fire extinguishing, and the strong mechanical gear action guarantees quick startup and includes efficient self-priming technology. Just like the rest of the Aurora fire pump family, the Model 300 is guaranteed to be the most efficient technology on the market today. With almost 95 years of experience, Aurora is a trusted brand across the globe and their products are built to stand the test of time. If your home or business needs a new fire pump system, trust the professionals at Steven Brown & Associates to get the job done right and install a premium fire pump system designed with you in mind. Questions? Give us a call at 302-652-4722 or send us an email at info@stevenbrownassociates.com. We would love to hear from you!